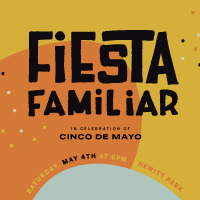 Come celebrate Cinco de Mayo at Hewitt Park! There will be fun activities for the entire family including - pony rides, inflatables, live music, games, face painting, paletas and a hamburger/hotdog cookout. This is a free community-wide event. Come join the fun, we'd love to meet you! Hosted by Viento Fuerte and First Woodway Baptist Church. Call 254.772.9696 for more details.